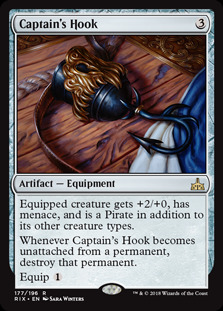 When Brazen Freebooter enters the battlefield, create a colorless Treasure artifact token with " , Sacrifice this artifact: Add one mana of any color." 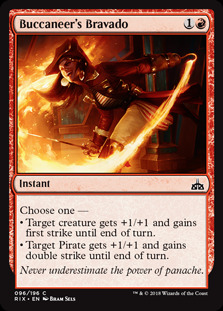 Enrage — Whenever Cacophodon is dealt damage, untap target permanent. 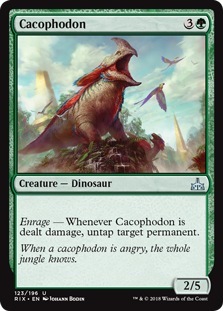 When a cacophodon is angry, the whole jungle knows. 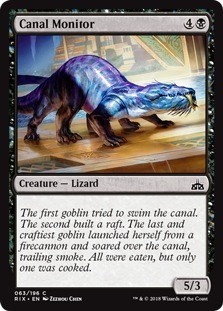 The first goblin tried to swim the canal. The second built a raft. The last and craftiest goblin launched herself from a firecannon and soared over the canal, trailing smoke. 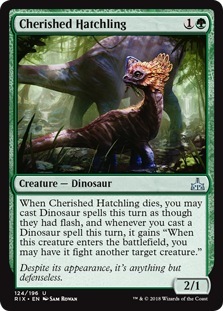 All were eaten, but only one was cooked. 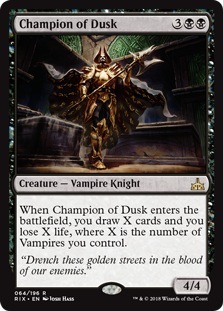 "Drench these golden streets in the blood of our enemies." 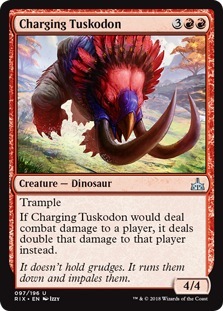 If Charging Tuskodon would deal combat damage to a player, it deals double that damage to that player instead. It doesn't hold grudges. 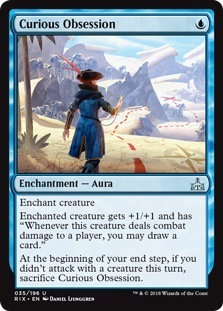 It runs them down and impales them. 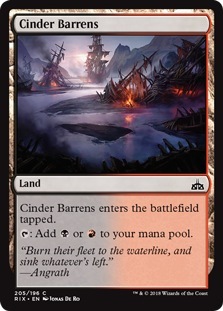 "Burn their fleet to the waterline, and sink whatever's left." 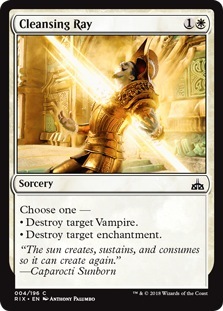 "The sun creates, sustains, and consumes so it can create again." 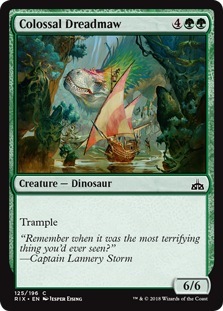 "Remember when it was the most terrifying thing you'd ever seen?" 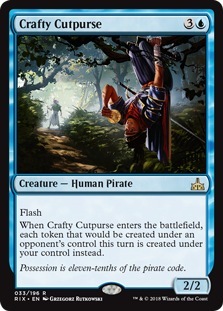 When Crafty Cutpurse enters the battlefield, each token that would be created under an opponent's control this turn is created under your control instead. 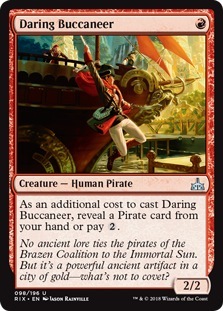 Possession is eleven-tenths of the pirate code. 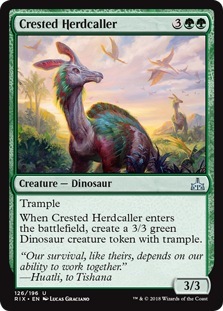 "Our survival, like theirs, depends on our ability to work together." 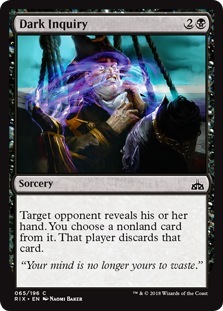 "Your mind is no longer yours to waste." 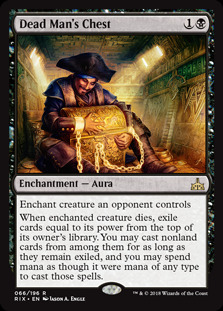 When enchanted creature dies, exile cards equal to its power from the top of its owner's library. 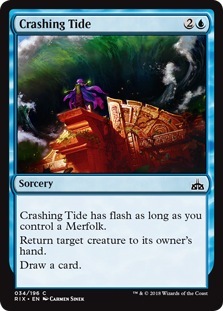 You may cast nonland cards from among them for as long as they remain exiled, and you may spend mana as though it were mana of any type to cast those spells. 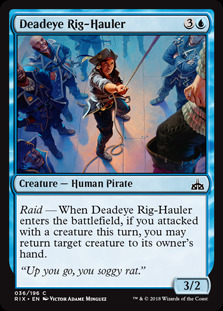 Raid — When Deadeye Rig-Hauler enters the battlefield, if you attacked with a creature this turn, you may return target creature to its owner's hand. 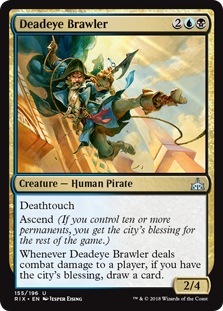 "Up you go, you soggy rat."